« Evening Grosbeak party at the feeder. We had 38 degrees yesterday..woohoo. I got out and attacked the drift at the end of the drive, we have been driving over it for a couple weeks. It was not consolidated into ice yet but it did require some effort with the metal garden shovel. I busted on it for about an hour before heading to the flats…I’ll work some more on it today as the forecast is for more of the same. On my trip in the flats I saw no less than three convertibles with the tops down and a bunch a people walking about in shorts…there was still snow on the ground there but my guess was that it was up near 55 or better. I got some more electrical supplies to do some more work on the solar power stations. 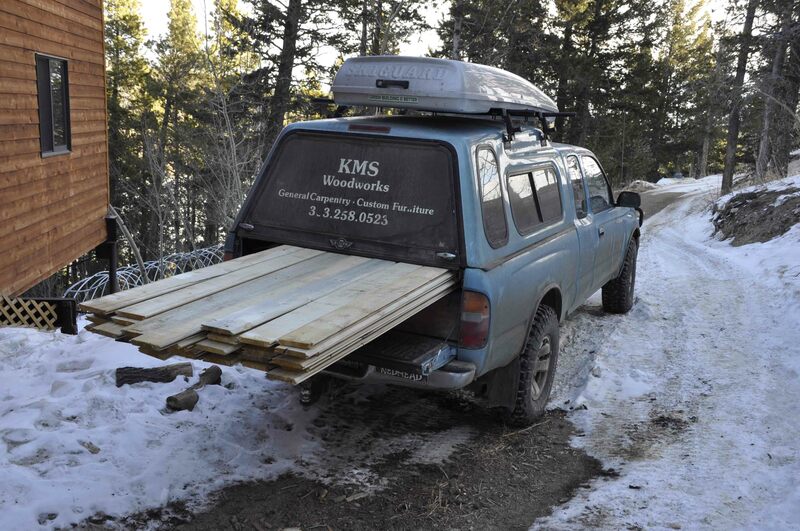 I also made the run to the sawmill to pick up some Blue Stain Pine T&G for the cabin. At 41 cents a lineal foot it is a great deal, I hope to get started with sanding and oiling it later this week. This is round one for the cabin, we will use it for the ceiling. I need to finish wiring for the LED lights for the main part of the room, but that should only take a few hours next time we are down there. I don’t know about you, but I am most definately ready for a thaw. Even then, here in chicago, we’re suppost to have highs of 20s and are almost touching 40 for the next two weeks. Craziness. A friend sent me this place and I thought I should check it out. I have owned big cats for a long time and actually enjoy their company. I recognise some people suppose they are nagging of picky or high-maintenance. But I enjoy their independence, their curiousity, and their sense of the total domain around them a massive jungle.